What a beauty we've got for you in this week's Vintage & Rare selection! It's a Kustom K200. Kustom, based in Chanute, Kansas, were of course known mainly for their amps - and in particular you may remember that they had a nice line of solid-state amps and speaker cabs covered in Tuck-And-Roll naugahyde in a choice of various glittery finishes - but like many other amplifier manufacturers it was almost inevitable that at some stage they'd want to test the market with their own line of electric guitars. The Kustom K200 is an example of the guitars bearing the Kustom brandname, which were only made between 1968 and 1969 so I guess they weren't a commercial success (and thank goodness they didn't cover the guitars in naugahyde!). 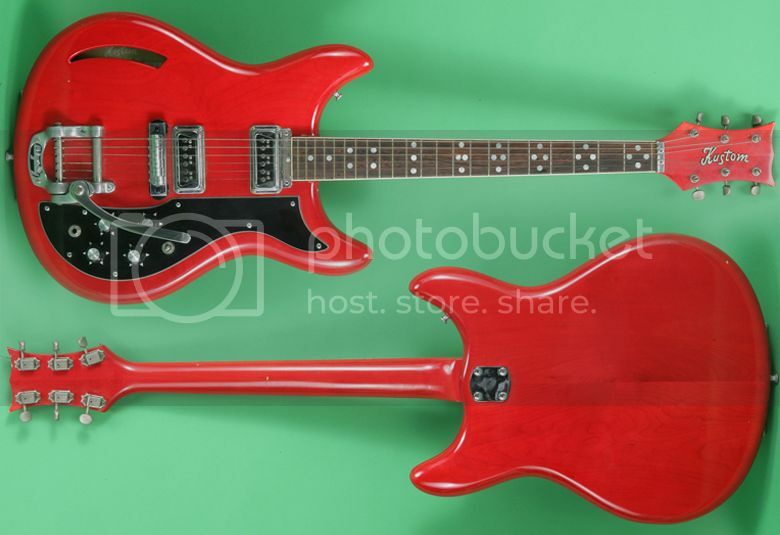 But what a gorgeous guitar it is, with possibly more than a nod to Rickenbacker in its design. Apparently these guitars were not re-branded instruments from another manufacturer like the Ampeg/Burns of London guitar we looked at recently; the K200 was an original design instigated by Kustom owner Bud Ross with input from country guitar legend Roy Clark. The guitar is a semi hollow and uses a similar construction technique to that of Fender's rosewood Telecaster and (I believe) Thinline Telecaster in that the front and back are formed from separate pieces that have been hollowed out and then glued together. Other features are a pair of DeArmond humbuckers, a Bigsby vibrato, and more fingerboard position markers than you could ever need! This guitar is currently being sold via Vintage & Rare, priced at $1,699. I'm still holding out for a K200 in the seafoam green/purple burst pattern. The shape echos the Nauga doll used to promote Naugahide, as used on Kustom amps. I have seen these guitars stripped of their pickups during guitar shows in the early 1990's. Dealers would buy them and yank the pickups to sell for twice the value of the guitar at that time. Leaving plunderd bodies for sale on the cheap. Wish I would have grabbed one. I have an early model orange sunburst K200 (with Bigbsy) that I purchased new and played a little during my high school years in the 1960's. Check out Eastwood Customs projects - they are a re-release of this model possibly in natural and red and they are looking for crowd funding. I saw ... and they even nicked my PhotoShop image showing the front and back of the guitar (as above)!